In the Groove - Music & Dance from the 50's to today! In the Groove is a musical production paying tribute to music and dance from the different decades, starting with the 50's to today! In the Groove is Florida's newest musical production. Journey with the cast as they pay tribute to chart topping hits and popular dances from each decade, starting with the 50's to today! Our show features live singing, choreographed routines, audience interaction, and more! 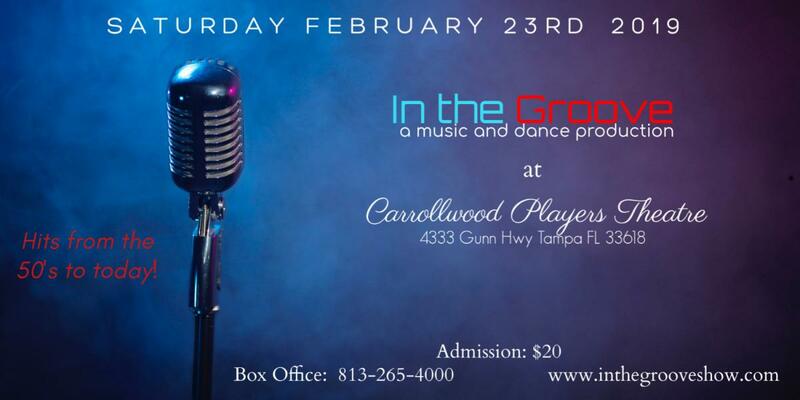 Come see our show on Saturday, February 23rd at Carrollwood Players Theatre in Tampa. Showtime is 3PM! PURCHASE TICKETS IN ADVANCE FOR FEBRUARY'S SHOW AND RECEIVE ONE FREE ENTRY TO WIN A BRAND NEW 32" TV!! !